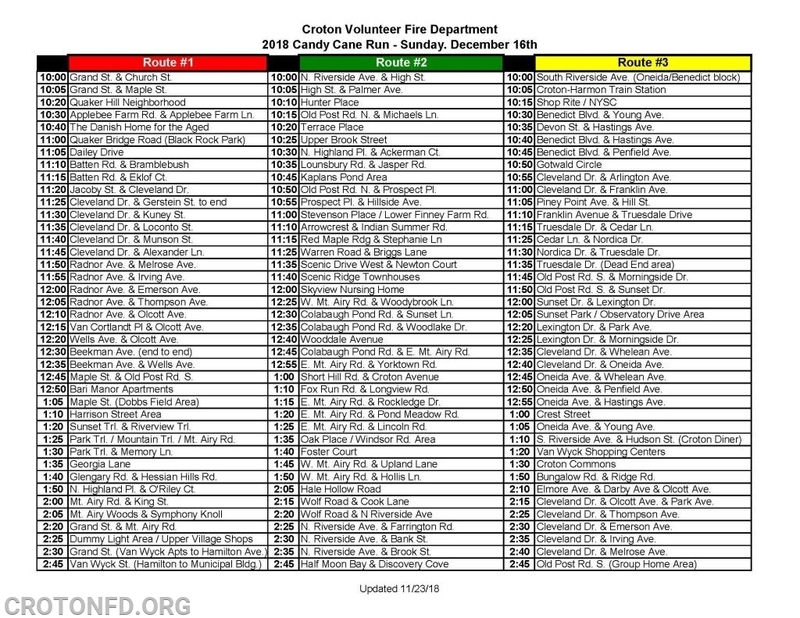 We thank you all for visiting us here on the internet, and encourage you to follow us at Twitter and Facebook (CrotonFire) for the most up-to-date Croton FD happenings! Please respect the content we so proudly share with you. The duplication of text, photos, video or any other content is prohibited without the written consent of the Croton-on-Hudson Fire Department. If you have any questions or would like to use any content from our website, please contact our webmaster by clicking here. Thank you for your cooperation and understanding, and we appreciate your support. Raise your hand if you're excited for the Holiday Season! As we have done for many years now, the Croton-on-Hudson Fire Department - in conjunction with the North Pole FD - has arranged for Santa Claus to visit the streets of Croton-on-Hudson on Sunday, December 16th from 10:00 AM until 3:00 PM. In order for this to be as successful as it is each year, it requires just a wee-bit of cooperation and coordination from all of you. If you plan on seeing us in your neck of the woods (and you know you do! ), we ask that you get to your "Stop" about 10 minutes early so there's no rushing. And, because of the swarm of peppermint-happy paparazzi and the potential we may have to respond to emergencies, there is always a chance we may be running late to your stop. We will do our absolute best to keep you all informed of how we are doing on our routes via Facebook and Twitter (@crotonfire) throughout the day. We look forward to continuing this fun-filled tradition with all of you, and wish you all a Happy, Healthy & Safe 2018 Holiday Season! 10:00	Grand St. & Church St.
10:05	Grand St. & Maple St.
10:30	Applebee Farm Rd. & Applebee Farm Ln. 11:15	Batten Rd. & Eklof Ct.
11:20	Jacoby St. & Cleveland Dr.
11:30	Cleveland Dr. & Kuney St.
11:35	Cleveland Dr. & Loconto St.
11:40	Cleveland Dr. & Munson St.
11:45	Cleveland Dr. & Alexander Ln. 11:50	Radnor Ave. & Melrose Ave.
11:55	Radnor Ave. & Irving Ave.
12:00	Radnor Ave. & Emerson Ave.
12:05	Radnor Ave. & Thompson Ave.
12:10	Radnor Ave. & Olcott Ave.
12:15	Van Cortlandt Pl & Olcott Ave.
12:20	Wells Ave. & Olcott Ave.
12:35	Beekman Ave. & Wells Ave.
12:45	Maple St. & Old Post Rd. S.
1:20	Sunset Trl. & Riverview Trl. 1:25	Park Trl. / Mountain Trl. / Mt. Airy Rd. 1:30	Park Trl. & Memory Ln. 1:40	Glengary Rd. & Hessian Hills Rd. 1:50	N. Highland Pl. & O'Riley Ct.
2:00	Mt. Airy Rd. & King St.
2:20	Grand St. & Mt. Airy Rd. 10:00	N. Riverside Ave. & High St.
10:05	High St. & Palmer Ave.
10:15	Old Post Rd. N. & Michaels Ln. 10:30	N. Highland Pl. & Ackerman Ct.
10:35	Lounsbury Rd. & Jasper Rd. 10:50	Old Post Rd. N. & Prospect Pl. 10:55	Prospect Pl. & Hillside Ave.
11:00	Stevenson Place / Lower Finney Farm Rd. 11:10	Arrowcrest & Indian Summer Rd. 12:25	W. Mt. Airy Rd. & Woodybrook Ln. 12:30	Colabaugh Pond Rd. & Sunset Ln. 12:35	Colabaugh Pond Rd. & Woodlake Dr.
12:45	Colabaugh Pond Rd. & E. Mt. Airy Rd. 12:55	E. Mt. Airy Rd. & Yorktown Rd. 1:10	Fox Run Rd. & Longview Rd. 1:15	E. Mt. Airy Rd. & Rockledge Dr.
1:20	E. Mt. Airy Rd. & Pond Meadow Rd. 1:25	E. Mt. Airy Rd. & Lincoln Rd. 1:50	W. Mt. Airy Rd. & Hollis Ln. 2:25	N. Riverside Ave. & Farrington Rd. 2:30	N. Riverside Ave. & Bank St.
2:35	N. Riverside Ave. & Brook St.
10:30	Benedict Blvd. & Young Ave.
10:35	Devon St. & Hastings Ave.
10:40	Benedict Blvd. & Hastings Ave.
10:45	Benedict Blvd. & Penfield Ave.
10:55	Cleveland Dr. & Arlington Ave.
11:00	Cleveland Dr. & Franklin Ave.
11:05	Piney Point Ave. & Hill St.
11:15	Truesdale Dr. & Cedar Ln. 11:25	Cedar Ln. & Nordica Dr.
11:30	Nordica Dr. & Truesdale Dr.
11:45	Old Post Rd. S. & Morningside Dr.
11:50	Old Post Rd. S. & Sunset Dr.
12:00	Sunset Dr. & Lexington Dr.
12:20	Lexington Dr. & Park Ave.
12:25	Lexington Dr. & Morningside Dr.
12:35	Cleveland Dr. & Whelean Ave.
12:40	Cleveland Dr. & Oneida Ave.
12:45	Oneida Ave. & Whelean Ave.
12:50	Oneida Ave. & Penfield Ave.
12:55	Oneida Ave. & Hastings Ave.
1:05	Oneida Ave. & Young Ave.
1:50	Bungalow Rd. & Ridge Rd. 2:10	Elmore Ave. & Darby Ave & Olcott Ave.
2:15	Cleveland Dr. & Olcott Ave. & Park Ave.
2:25	Cleveland Dr. & Thompson Ave.
2:30	Cleveland Dr. & Emerson Ave.
2:35	Cleveland Dr. & Irving Ave.
2:40	Cleveland Dr. & Melrose Ave.